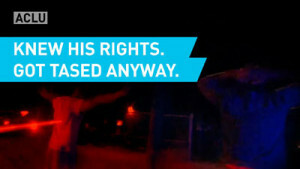 See video at: https://www.facebook.com/aclu.nationwide/videos/10153710102076813/, taken from an officer’s body camera and released by the ACLU last September, gained national attention and accumulated more than one million views. “Through constructive, respectful dialogue, the ACLU of Colorado and the City of Aurora, through the City Attorney’s Office, were able to work together to resolve this case promptly and without expensive and time-consuming litigation,” said ACLU of Colorado Legal Director Mark Silver-stein. “The ACLU commends the City of Aurora for its willingness to come to the table in good faith to find a resolution that is fair to Mr. Kelley and beneficial for taxpayers of the City. On Feb. 19, 2016, Kelley and his cousin were walking along 14th Avenue in Aurora when they were stopped by Aurora police officers who were responding to a call about a potential crime at a nearby apartment complex. The officers had no description of a suspect and no reason to believe that Kelley had been involved in that incident or in any other criminal activity. Following the officers’ orders, Kelley placed his hands in the air and turned around. He kept his hands up with his fingers outstretched; making it clear that he was not a physical threat. He briefly pointed to his chest as he declared, “I know my rights.” At that moment, an officer shot him in the back with a Taser. He lost all muscular control and fell straight backwards, striking his head on the street pavement. Aurora Police arrested Kelley and charged him with disorderly conduct. He spent three days in jail before he could bond out. ACLU lawyers successfully defended Kelley in the criminal case, winning dismissal after filing a motion arguing that the illegal street detention violated the Fourth Amendment. In addition to Silverstein and Wallace, Kelley was represented by ACLU Cooperating Attorneys Ahson Wali of Elinoff and Associates LLC and Dan Recht and Megan Downing of Recht Kornfeld PC.